Home > Services > Articles & White Papers > Can you hear me now? Can recycled pitchmen really boost another brand? Can you hear me now? Can recycled pitchmen really boost another brand? The Most Interesting Man in the World is back. No, not that Most Interesting Man in the World, the younger one who replaced the original Most Interesting Man in the World. Let me start over. Actor Jonathan Goldsmith, formerly known as the Dos Equis Most Interesting Man in the World, is back in the alcoholic beverage promotion business (presumably after his non-compete agreement expired), this time fronting Astral Tequila, a fledgling brand in which Goldsmith owns an equity stake. Now both want us to remember that we know them from somewhere else, but also to think of them in relation to a new brand. But, in doing so, they both become fainter versions of themselves. Is that good for brand building? I doubt it. Here’s why. The campaign that brought us the “Verizon guy” was very strategic at the time because the industry was still dealing with occasionally spotty cell service. While Marcarelli was firing off, “Can you hear me now?” five to six times per commercial, real-life mobile phone users were saying the exact same phrase all over the country. Verizon’s campaign was about quality of coverage. They seized on a venerable catch phrase and had all of us as unwitting assistants, in a sense. The campaign was not about the charms or endorsement value of Marcarelli’s character. 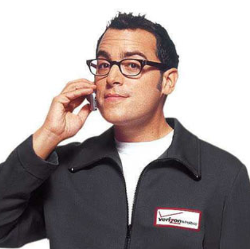 But, what happens in the mind of the consumer who sees the spots for Sprint is something like this—“Oh that’s the guy from those Verizon commercials, he was kinda funny. He used to walk around…” So I ask you, is this person thinking about the Sprint brand or the Verizon brand? Or both? Is there a net gain there for Sprint? If there is, it’s negligible. Goldsmith is even more direct in his spot when he holds up a glass and says, “I told you, I don’t always drink beer. Astral Tequila.” When we see this spot, we have to think of another brand, Dos Equis, to get the context of the character, just as we have to remember Verzion with the Marcarelli/Sprint spots. Sprint may be betting that by openly converting a former Verizon asset to their brand it may build a practical image of switching for the best price deal, which is Sprint’s main marketing play right now, anyway. Will it help them pull out of fourth place in the wireless wars? Probably not. Astral Tequila may have a better chance, since both Goldsmith-endorsed brands have a Mexican element to them and Goldsmith himself appears to be the same character. It would make more sense, of course, if Dos Equis owned Astral, which it does not, since then the equity in the character could be shared, or even confused, but would still benefit the brand. So, grabbing a well-known pitchman off the scrap heap might seem like a good idea, but it’s not a new idea, just a retread of another brand’s campaign. And retreads are never as good as the original tire.